You are here: Home / Blog / AvPlan / AvPlan 2.0 is here! Find the shortest IFR route between any two points on an IFR airway. Super fast maps, especially on the iPad 3. There are also an enormous number of small changes which improve usability on the ground and in the air. 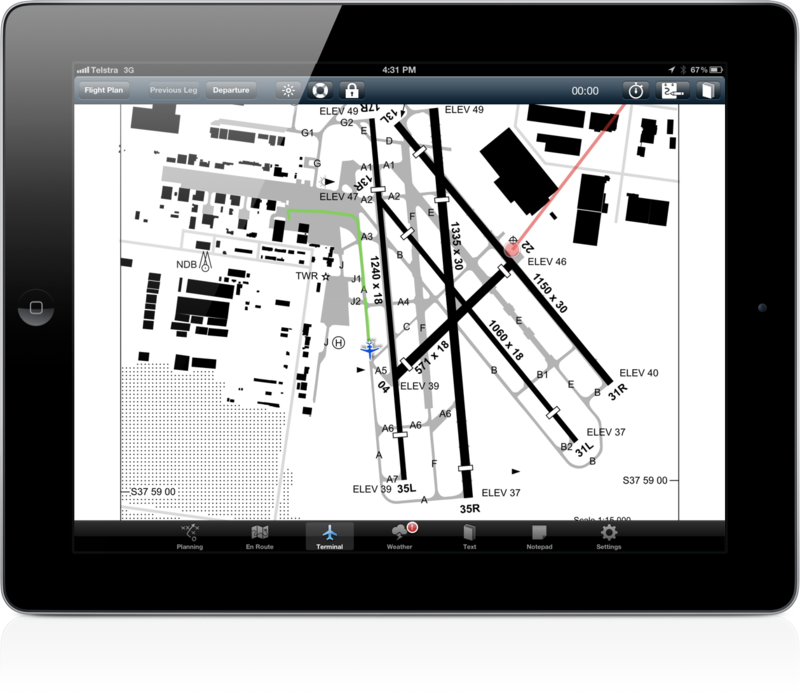 The new geo-referenced airport taxi diagrams and instrument approach plates show your position, ground track and routing. We have even added support to enable the full route editing functions (tap and drag waypoints, tap and hold on a route to insert a waypoint) on these charts. The weather overlay has been completely redone, and now supports radar and lightning on all map types. The animation can also now be paused, and stepped forward and backward. AvPlan 2.0 will now warn you if it thinks you are going to bump into terrain, and gives you a 500ft altitude callout on descent. For the IFR and Night VFR pilots, AvPlan 2.0 will automatically search for the shortest IFR route between any two points on an IFR airway. Find the shortest route to fly IFR across the country in seconds. Double tap on a PRD area will show you its current status and any other relevant NOTAM’s. You can even use the search button on the En Route page to search for PRD areas. The GPX export function now supports exporting your flight plans in a format that your portable Garmin GPS will understand. NOTAM’s for airports are displayed when viewing a navaid associated with an airport. We have also changed the subscriptions, merging the Planning and VFR Upgrade into ‘AvPlan VFR’ (for the same price as the two combined packages). https://www.avplan-efb.com/wp/../shared/content/uploads/2011/09/Screenshot_taxi_2.png 1092 1259 admin https://www.avplan-efb.com/wp/../shared/content/uploads/2016/10/newlogo2.png admin2012-08-08 11:01:392012-08-08 11:03:39AvPlan 2.0 is here! wow.. that’s awesome guys.. well done. Looking forward taking the new version on a flight next week.